Home » Our Doctors » David M. Johnson O.D. Dr. Johnson completed his Doctorate of Optometry at the University of Houston in 2008. 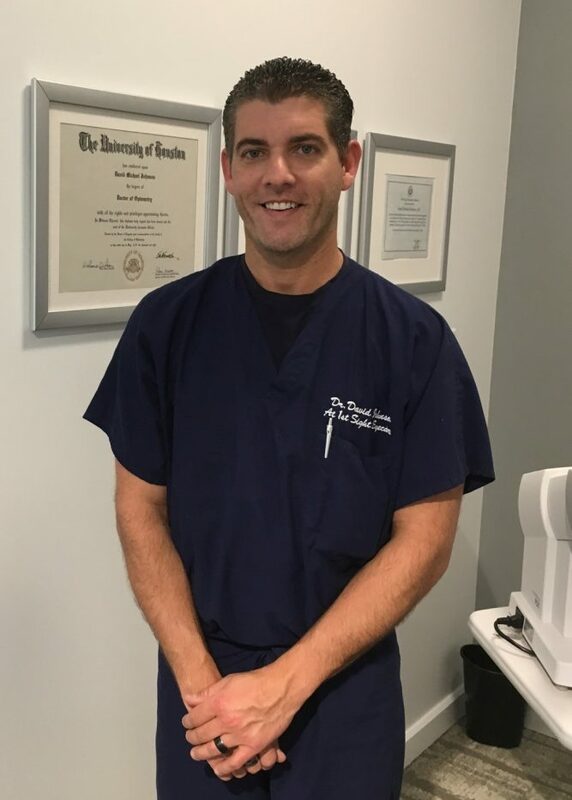 After graduation, he was licensed by Texas Optometry Board in July 2008 as an Optometric Glaucoma Specialist, and served as Clinical/Surgery Director with one of the largest Optometry and Ophthalmology providers in the state of Texas. While serving in this role, he provided comprehensive patient care specializing in the diagnosis and treatment of ocular diseases, contact lenses, laser refractive surgery consultation (LASIK, PRK), and cataract surgery consultation. Dr. Johnson has also served as an adjunct professor in which he helped train interns in their final year of training from the University of Houston College of Optometry. He also helped to train ophthalmology residents from The University of Texas Medical Branch Galveston as they learned to perform LASIK and PRK surgery. During his 8 year tenure in this position he also served as a clinical investigator for various ocular pharmaceuticals seeking approval by the FDA. Dr. Johnson founded At First Sight Eyecare in 2016. At First Sight Eyecare now has two locations, Willowbrook Mall(Macy’s) and First Colony Mall(Macy’s). Both offices are affiliated with Lenscrafters at Macy’s. Dr. Johnson’s professional affiliations include the Texas Optometry Association, Optometric Council on Refractive Technology, American Optometry Association, American Academy of Ophthalmic Executives, and American Society of Cataract and Refractive Surgeons. Dr. Johnson’s hobbies include traveling with his wife, Nicole, and their son, Cayden. He is also an avid sports fan and enjoys attending professional sporting events.